Published in the Dover Express, 26 December, 1980. Three years later, however, the East Kent Road Car Company offered to run buses in Dover. Unable to reach a decision the town council engaged the services of the manager of the Birmingham Corporation Transport Department to advise them on three possible schemes: the retention and overhaul of the existing tramway service: the operation of corporation buses, or the acceptance of the bus company offer. The East Kent, which began operations shortly after the first world war, had already absorbed a number of smaller bus or coach operators, including Pullman Motors and South Coast Motor Services, whose excursion buses and coaches were often seen in the Dover area, and virtually had a monopoly of public road transport in East Kent. The exceptions were the tramway districts of Dover and Thanet. The Tramways Committee at Dover rejected the Bus Company's first offer, resolving to operate trams until March 31, 1936, and to promote a Bill to obtain powers to run corporation buses. Their resolution, however, was rejected by the town council which, by the end of the year had approved an agreement for the bus company to operate public transport services in Dover. Under the agreement the corporation was to receive three-quarters of the profit after working expenses had been met and a capitation charge of three old pennies per mile had been made. The corporation were to have no liability in the event of any loss. So, at 11.20 a.m. on December 31, 1936, Dover Tramway services ceased. The last tramcar (No. 10. which had come from Birmingham) was driven by the Mayor, Alderman George Norman, from Worthington Street to Maxton and the first motor bus took the mayor and his party back to the town hall just before midnight. A large crowd gathered in Biggin Street and Worthington Street to see the last tramcars and the first bus, bearing the inscription Dover's First Bus, make its way to Maxton to start the short journey marking the transition from tramcars to buses. There were so many people wishing to make the final journey by tramcar that the normal service car had to be supplemented by two extra cars for the trip and these too were quickly filled. The Dover Express reported that practically along the entire route the procession was greeted by people cheering or waving from doors, windows and street comers. On the arrival at Maxton flashlight photographs were taken of the mayor, officials and tramway staff and there was a certain amount of looting, electric light bulbs and other removable parts of the tramcars soon disappearing, to be treasured as souvenirs. Tramcar passengers then transferred to “The First Bus“ or the Folkestone service bus which waited behind it, for the journey to the town hall where the mayor and his guests saw the Old Year out and the New Year in and toasted the success of the new venture. The driver of the last official tramcar was Mr P. R. Sutton, the conductor, H. Blaskett, and among the passengers was Inspector Pay who had driven the first Maxton cars 39 years before. Driver of the first 53-seater bus was Mr W. F. Fairweather, and the conductor was A. Corteel. There was also a good deal of celebrating when the last tram to Buckland left the pier terminus. Special tickets were issued as the full car left the Worthington Street junction and there was looting, singing and cheering along the route to the tramsheds, together with loud explosions from detonators placed on the track. All of the conductors employed on the tramcars who were over 18 years of age and who had been granted a licence to act as a conductor were to be taken on by the bus company. The majority of drivers, who were given free tuition in driving buses, and who obtained public service vehicle licences, were also to be employed by the company. Buses were garaged at St James’ Street and it was proposed to use the Buckland tramshed for express coaches. The open-top trams were simply driven out to the sleeper-track at River under their own power and destroyed by burning. Other cars were disposed of by contract and, it is understood, were also destroyed. Overhead wires were quickly removed but sections of track remained hidden under tarmacadam road surfaces or were utilised as footpath kerbing, for many years. Receipts in the first year of the tramway operation were £7,478 and in the second year £9,882, representing a total of 4,166,802 passengers. Pessimists expected that the traffic would fall off after the novelty had subsided but, on the contrary, it increased, the annual revenue, for the ninth year, for instance, having risen to £11,803. Even in the early years the undertaking, contrary to the expectation of some sceptics, yielded a useful profit, which was used to keep down the Borough Rate. The idea of the original promoters was that if the tramway only paid its way it would be a great public asset and a means of providing employment for a large staff on the cars and at the Electricity Works. The fares charged on the trams from the commencement of the Dover tramway were much less than those of the horse-buses they superseded. In fact they were probably too low and with hindsight the wisdom of devoting profits to reducing the local rates instead of setting it aside to meet replacements was also questionable. Although income from fares increased to £11,057 in 1907-08 operating costs in the first ten years exceeded income. The opening of the River service added to the debt charges which had to be met but had little affect on revenue. Cost of power was high, despite the fact that the Corporation operated its own electricity generating works and it was 30 years before the excessive charges, compared with other tramways, were seriously challenged and then greatly reduced. From 1908 until 1928 rate aid was necessary to keep the trams going. One year the contribution reached nearly £9,000. The situation improved as some of the early loans were paid off and it was possible to meet the cost of replacement second-hand trams from revenue or a renewals fund which was set-up. When it was realised that a switch to buses might be made it was possible to cut back on expenses, such as repairs to track and cars, so that in two years enough reserves had accumulated to meet all the outstanding loans and meet the rest of lifting the track and re-instating the roads when the tramway ceased operations. Dover, in addition to the foregoing, used to boast a number of municipal undertakings for the promotion of the social well-being of the people. They were not to any great extent productive, but, at a very moderate expenditure, they complied with the motto: “The greatest good to the greatest number. Market day in Dover in the early part of the century. 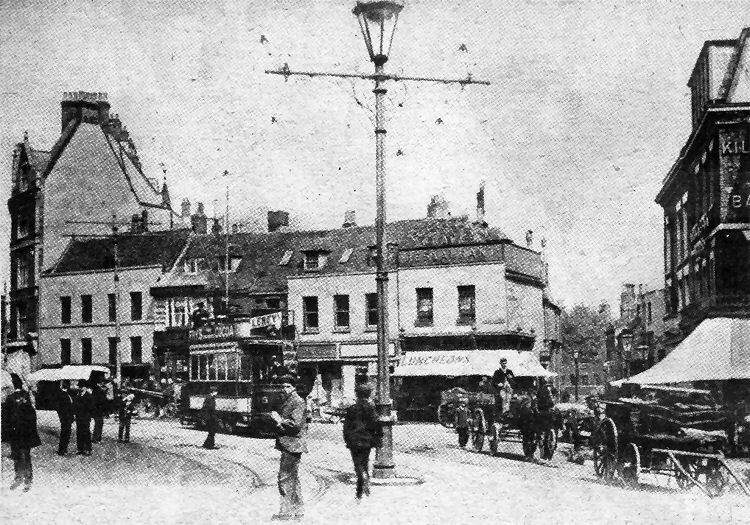 In the centre of this picture postcard view of the Market Square is one of the open-top tramcars heading for King Street and New Bridge. It will be seen that Lloyds Bank had not been built. Igglesden and Graves Restaurant and bakery, now Weaver’s the stationers, on the corner of Castle Street, underwent considerable alterations not long after this picture was taken. At the time that the bank was built the frontage of the popular restaurant was completely removed and rebuilt in a form similar to that which we see today. Behnid the tram is the diminutive old Garricks Head public house, which was pulled down to make way for the bank.